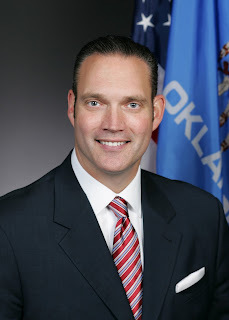 In comments to the Oklahoman, House Speaker Charles McCall (R-Atoka) anticipates that the State House will move quickly to take up the "revenue raising" (i.e. tax increasing) portions of the Step Up Oklahoma plan put forward by Governor Fallin's oligarchs community and business leaders' group. The Step Up Oklahoma plan includes about $750M in new taxes, raised via increasing the cigarette tax ($243M), GPT ($133M), gasoline and diesel tax ($170M), income tax ($144M), and a vareity of smaller tax increases and expansions. Session begins on Monday, and McCall believes they will begin voting sometime during the week on elements of the Step Up plan.